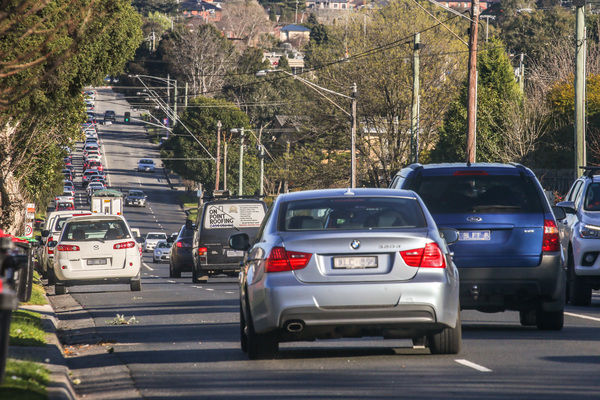 Parked cars are causing chaos on Heatherton Road in Noble Park, drivers say. Former Greater Dandenong policeman Bob Graham is calling for a clearway during peak times to alleviate the gridlock and accident risk. He said Heatherton Road was a blackspot because of rear-end accidents that happened when vehicles drove around parked vehicles. “A number of properties along Heatherton Road from the South Eastern Hospital right through past the rail line now have dual occupancy,” he said. “They have more cars than they have parking spaces. Mr Graham said he was worried about traffic flow because it was no longer two lanes in each direction. “Morning peak you can’t run two lanes each way,” he said. Councillor Sean O’Reilly raised the issue at the Monday 24 July council meeting. He said the parking was “causing traffic on Heatherton Road to weave in and out of parked cars, causing dangerous traffic patterns and increased likelihood of accidents”. “I have experienced having the number of lanes intermittently change from two to one based on parked cars on Heatherton Road,” he said. “Heatherton Road west of Springvale Road is a clearway. “If it’s OK west of Springvale Road, why not have a clearway east of Springvale Road? He asked whether the council could prepare a case for Heatherton Road to be a clearway between Springvale Road and Princes Highway during peak hours, and asked for accident statistics. Acting engineering services director Craig Cinquegrana said the council could look at peak time parking restrictions, but a clearway would require VicRoads approval. “It’s a means of achieving the same objective,” he said. He said that in the past five years there’d been six crashes along the stretch in question, “one we can particularly identify as being caused by veering around a parked vehicle”. Mr Cinquegrana said there’d be a proposal presented to the council’s parking review committee. Greater Dandenong Highway Patrol Acting Senior Sergeant Phil Dalgleish said clearways during peak hour times did assist with traffic flow, and he welcomed any consideration for improving traffic flow. VicRoads Metro South East Regional Director Aidan McGann said the authority regularly monitored parking patterns across the road network to determine whether clearway zones were appropriate. “Currently we are not considering clearway zones for this section of Heatherton Road,” he said.